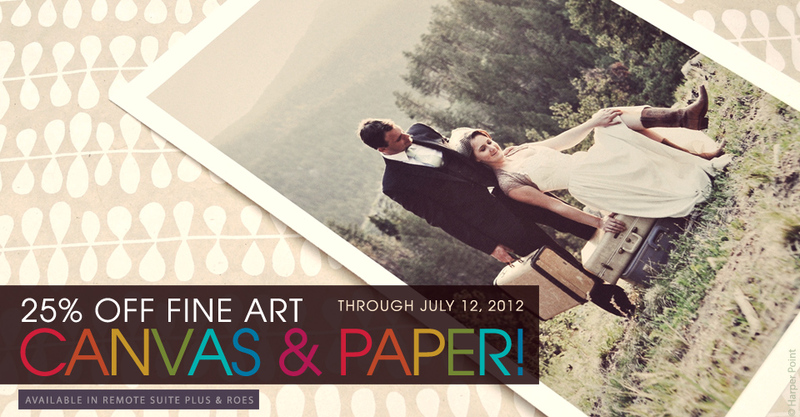 For three days only, save 25% on Fine Art Canvas and Fine Art Paper orders July 10 through July 12! The sale includes all sizes from 8×10 to 40×60, including custom sizes, when ordered through Miller’s ROES or Remote Suite PLUS Wall Art. Please Note: Gallery Wraps and finishing services are not included in the discount. Sale ends at midnight (Central) on July 12, 2012. I just placed my order in ROES and the sale price is not reflected in my order summary. Am I really receiving a discount? Yes, you are receiving the discount; however, the sale price will not be reflected in order summaries or email confirmations when using ROES to order. The discount will only appear after the order is transmitted and received by the lab. The sale price will be reflected in order summaries if ordering in Remote Suite PLUS. I uploaded a canvas or paper order just prior to the start of the sale. Can I receive a credit? Unfortunately, any Fine Art Canvas or Paper ordered prior to the start of the sale will not be credited.